Give your managers or executives - especially CEOs, CMOs or CIOs - the high-level view of the digital marketing data they want. An executive dashboard lets you track your KPIs across multiple digital marketing tools and present real-time data in a single dashboard. Digital marketing doesn't happen on just one platform. You've probably got multiple campaigns going, from social media to paid ads to SEO. Your managers or executives will want to know whether your digital marketing efforts are bringing in paid customers and, with our dashboard software, you can use data visualization to easily show them that your hard work is paying off. Best of all, you don't need a computer science degree or knowledge of SQL to run marketing analyses. An executive dashboard lets you demonstrate the value of your work to your managers. You can combine data from multiple data sources and present the key performance indicators that your leadership team is interested in. Once the data sources are integrated, you'll be able to present the key metrics in real-time. No more plugging numbers into Microsoft Excel! Why use an executive dashboard? Your managers or executives want to track business performance. Digital marketing is an essential part of that and it's important to give them the data they need to decide on strategic objectives and inform their decision making. Using an executive dashboard makes this process easier and faster and allows for better digital marketing project management. What are the benefits of executive dashboards? First, you'll have a KPI dashboard with all of your digital marketing analytics in one spot and you can present everything from high-level data such as revenue or drill down into the data. It will also let you demonstrate the value of your work to your managers, let your managers track the ROI of digital marketing efforts, and enhance customer relationship management. Create your own executive dashboard today! What are the best executive dashboard KPIs? 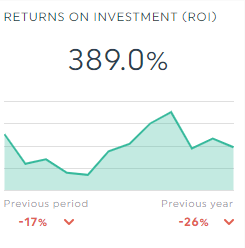 There are a ton of KPIs you can include in your operational dashboard. An effective executive dashboard will include the ones that give managers the information they need without overwhelming them with details. This will ensure management-level employee engagement with your marketing reports. The bottom line is always a key consideration for business leaders. This will tell them exactly how much has been spent on digital marketing and how much money has been made. Revenue by source gives you a breakdown of how much money has been made from the sales of each product. ROI is a comparison of the costs of marketing a product and the sales of that product. A positive ROI is always the goal of a good marketing campaign. 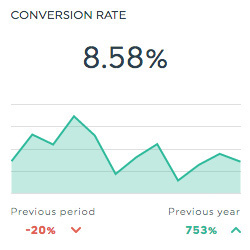 Conversion rate tells you how many visitors to your website take a desired action, such as buying a product, signing up to a service, or subscribing to a newsletter. What are the top executive dashboard metrics? You're tracking metrics from across multiple marketing channels, so it's important not to get bogged down by what we call "vanity metrics" (that seem pretty but don't really offer any actionable insight). Instead, your business dashboard should focus on those key marketing metrics that your managers can relate to and act on. This metric shows the total number of visits (sessions) your website experienced. A visit (session) occurs when a user is actively engaged with your website or app. This metric shows the number of and sources of traffic that came to your website from outside of Google’s search engine. This metric shows the total number of conversions that Google Ads (formerly Google AdWords) measure across all conversion actions. This metric shows how much it costs you every time someone clicks on one of your paid ads - whether on Google, Bing or social media. What platforms should an executive dashboard include? A cohesive digital marketing dashboard should include data sets from every channel you use for your marketing strategies. Combining and comparing your data points will enable you to generate business intelligence and help managers and executives to reach business goals. We support over 34 website analytics programs, from email systems like Mailchimp to SEO tools like SEMrush. Create your own executive KPI dashboard with all your key performance metrics in one place. DashThis' executive dashboard sample is a powerful tool that gets your marketing team off to a running start, thanks to its preset KPIs, multiple available data sources, and easy-to-use features. Plug in your own data from across different marketing platforms for easy visual representation of your data. Displaying your marketing analytics is as easy as 1-2-3! Ecommerce, email campaign tools, Google Analytics, social media... connect all your tools and DashThis fetches the data automatically! You can choose from among our preselected executive dashboard templates, or create your own from scratch. It's all a matter of dragging-and-dropping the KPIs you want! Since your analytics dashboards are really your way of showing the results of your marketing efforts to your bosses, it's important that they reflect your brand. A set of strategic dashboards can take your digital marketing game to the next level. We've got other dashboards for every marketing specialty - here a just a few. Clients don't need to see every single business metric that marketing professionals do. The KPIs you choose should be actionable and relevant to clients! Choose this dashboard if you need to optimize your sales pipeline and track KPIs like transactions, revenue, product sales, and conversion rate by channel. Build a report to work out whether your advertising campaign was worth it. If you're not sure which metrics to track, you can use our preset template. Digital marketing without measuring, reporting, and analyzing is like flying blind! Get tricks of the trade from our team to create the best marketing dashboards that your team and your clients can use regularly to create better campaigns and marketing strategies!